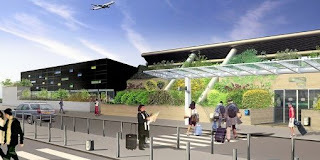 Montpellier airport to expand (new building is pictured on the left of the present building). The work, which will cost around € 4 million, fully funded by the airport company, will increase departure capacity. Upstairs at Montpellier airport, a new area will be dedicated to boarding will also encorporate a larger duty free shop - 4 times larger than the present kiosk. It will also house a restaurant area of 500 sqm. With the delivery of this future building for Montpellier airport, whose appearance contrasts with the existing architecture, the lounge will increase the area by a third. "The expansion of the terminal responds to a desire to provide both comfort and speed on departure, "said Cyril Reboul, chief executive of the airport. "Our goal is to prepare the future"
Cyril Reboul said the work at Montpellier airport costing € 4 million should be completed in June 2013.